Full of the abundance of tulips, this Keukenhof IV tapestry shows the gardens of the huge flower garden in Holland. Here we see red and yellow tulips among the trees and park house. The Kuekenhof gardens is a most visited and loved park in Holland, near Lisse which has over 32 acres of flowers and gardens. 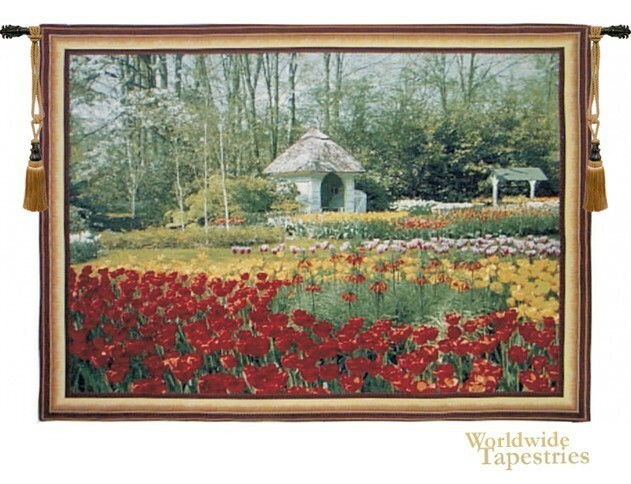 This Kuekenhof IV tapestry is backed with lining and tunnel for easy hanging. Note: tapestry rod and tassels, where pictured, are purchased separately.